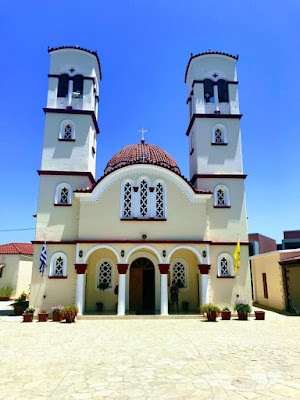 The most photographed landmark in Georgioupoli is the tiny white chapel dedicated to Aghios Nikolaos at the end of a rocky artificial breakwater that juts out into the bay between the harbour and the beach. 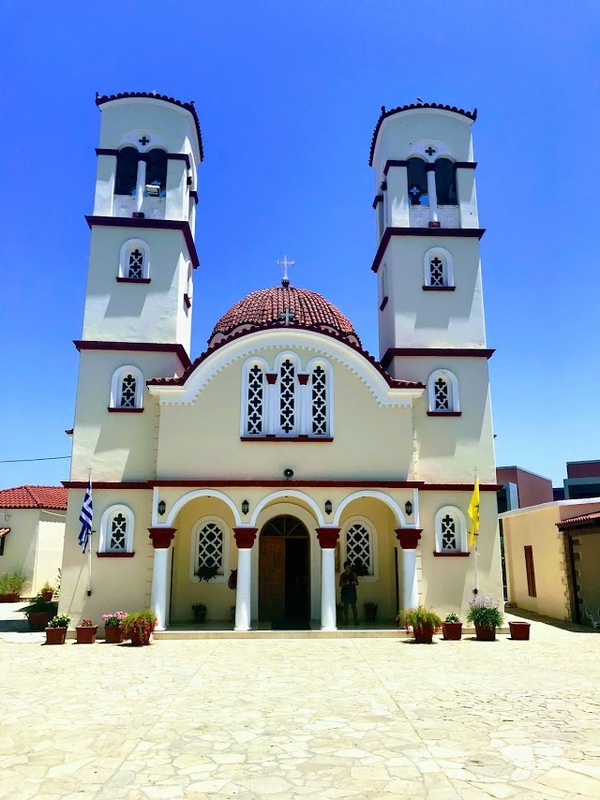 It is popular with tourists who are encouraged to make their way out to the chapel and to light a candle there, and sometimes it is a popular venue for weddings, although it is difficult to imagine how a bride could make here way there in a full wedding dress, even if she used a boat and the waves were calm. 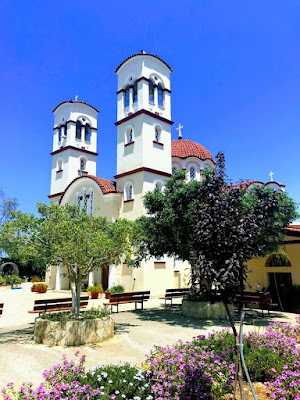 But tourists who spend most of their time at the seafront are unlikely to notice the tiny chapel of Saint Barbara, hidden in quiet corner, tucked away beside the harbour. The principal church in this resort, however, is Analipsi Church (Εκκλησία Ανάληψη) or the Church of the Ascension. This church is back from the seafront, away from the main square and shops, and set in its own gardens. 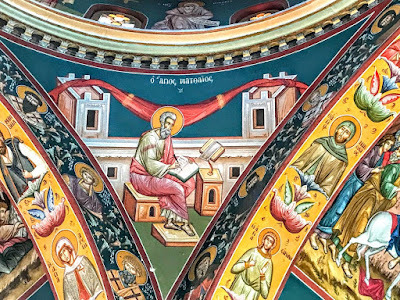 On the outside, it looks like a confident statement of Greek and Orthodox identity in this town, built with a greater capacity that the needs of a small resident community. 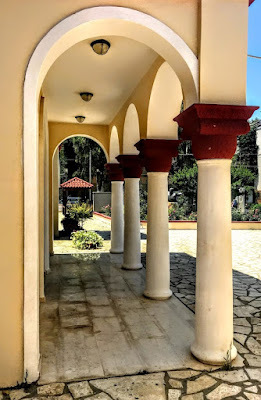 The church is cruciform in shape, has two tall bell towers, and porches on three sides. 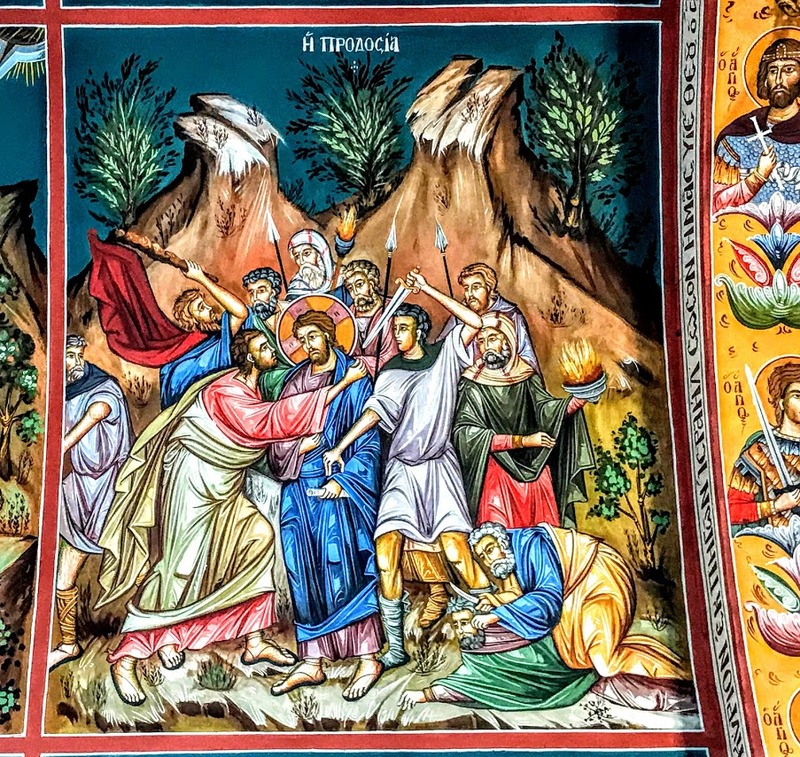 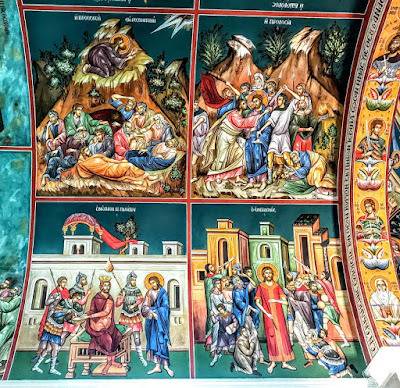 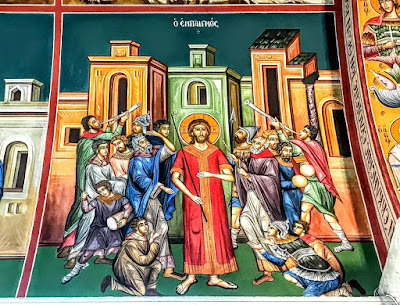 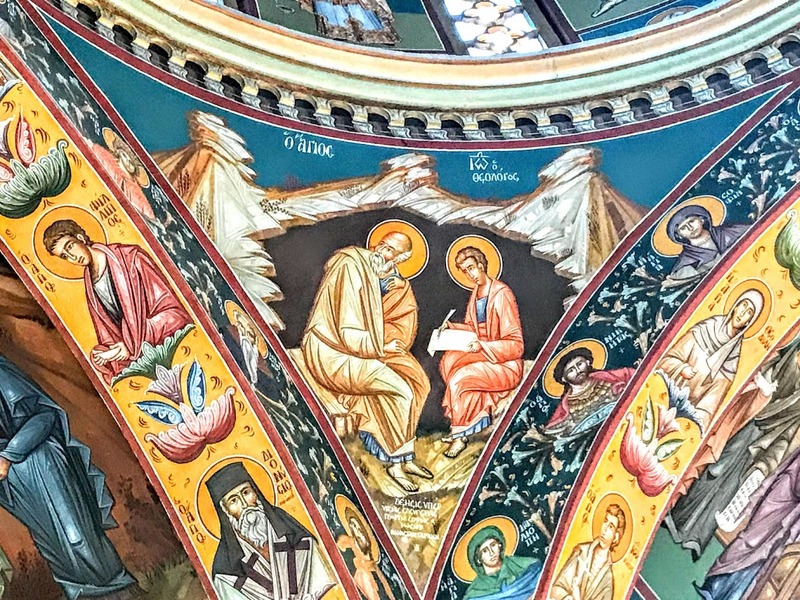 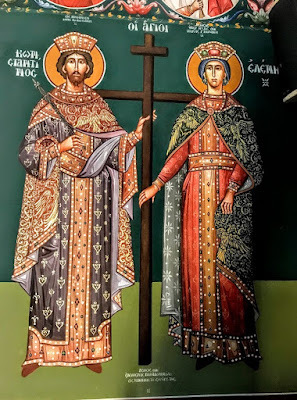 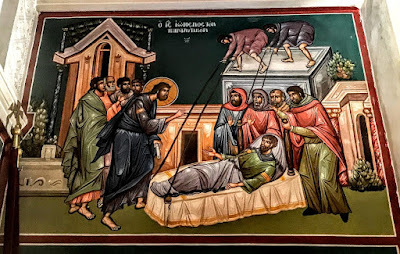 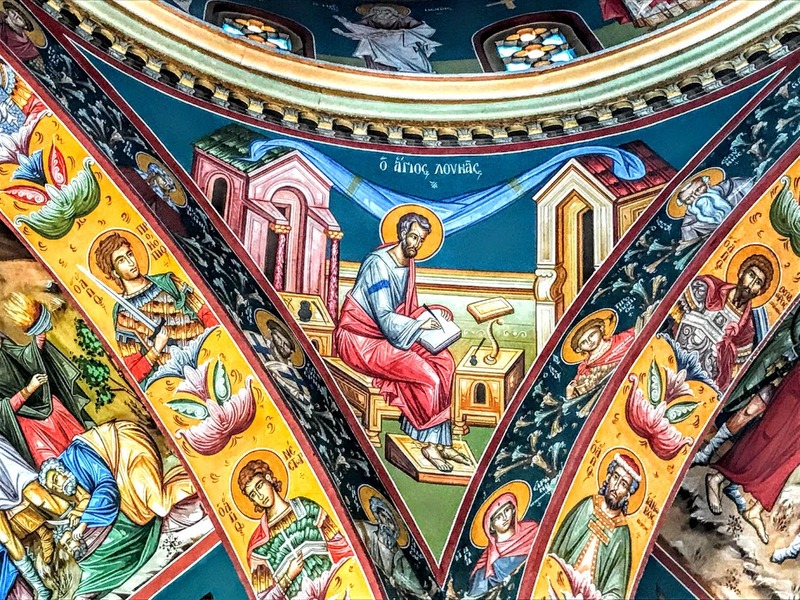 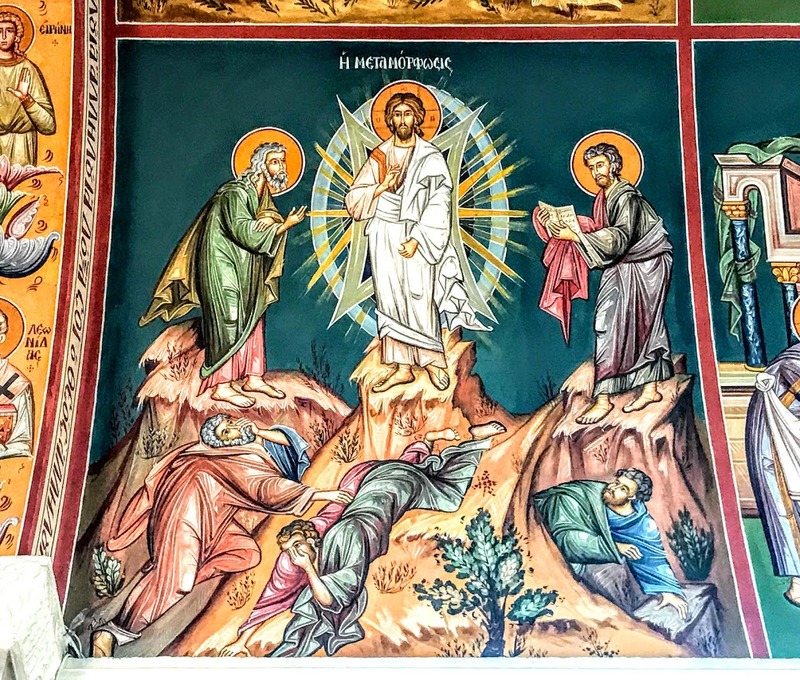 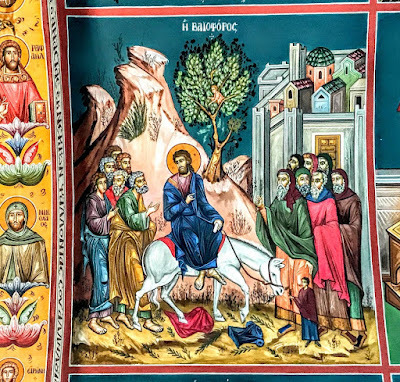 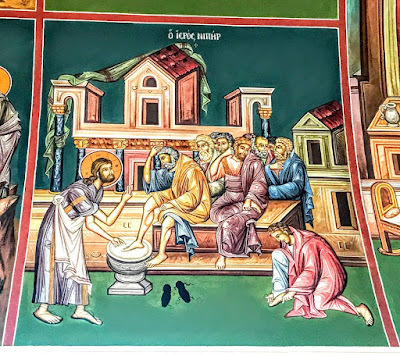 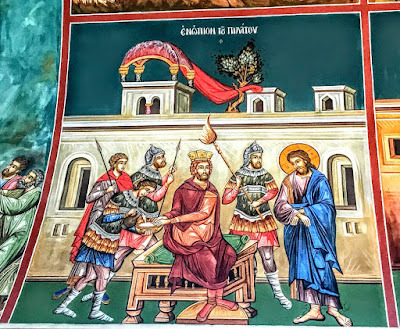 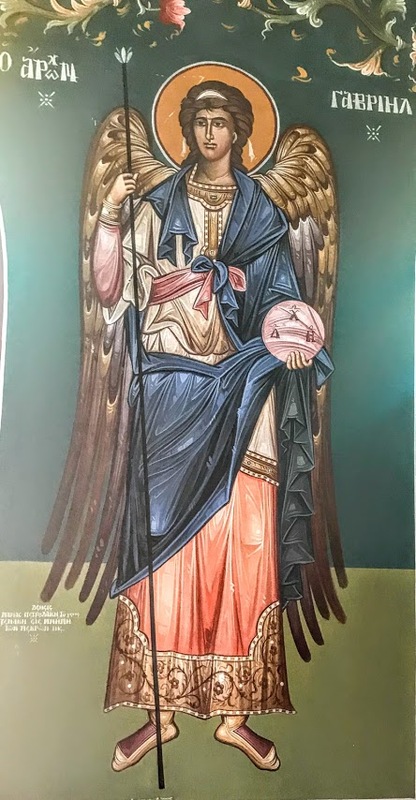 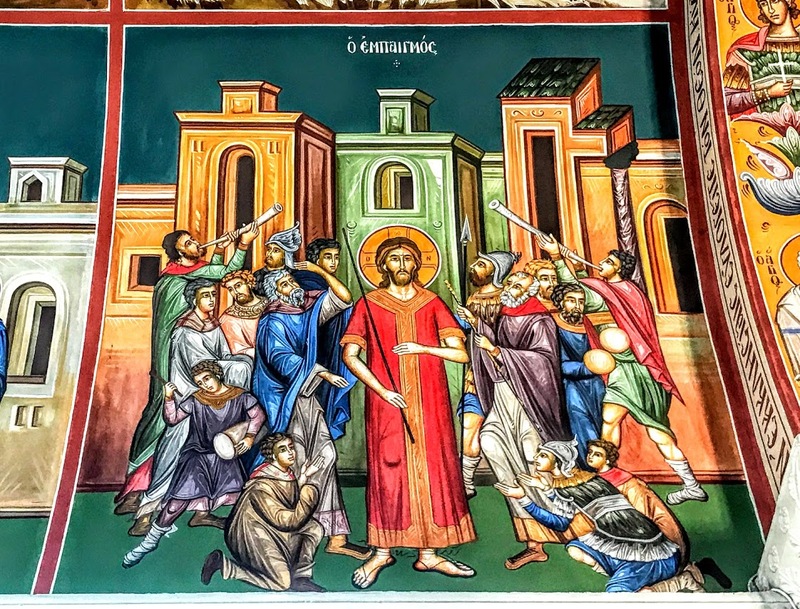 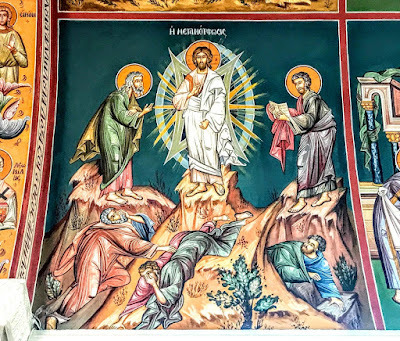 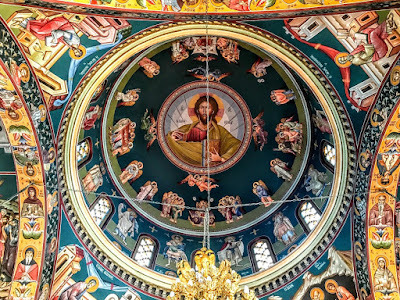 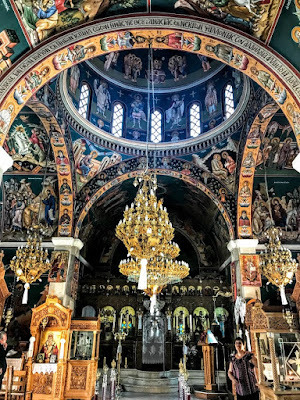 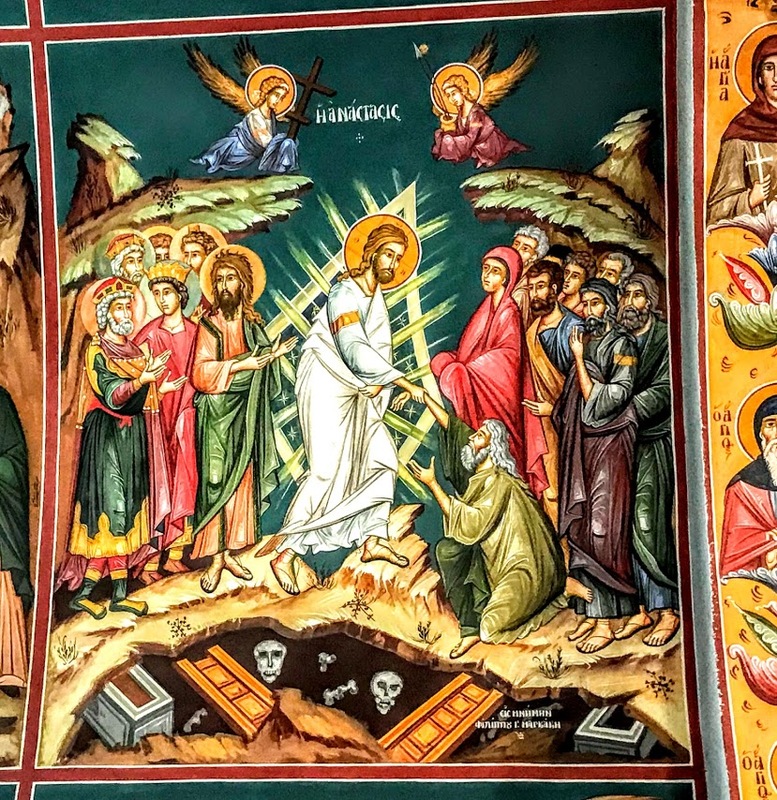 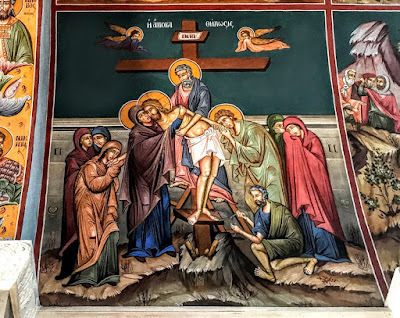 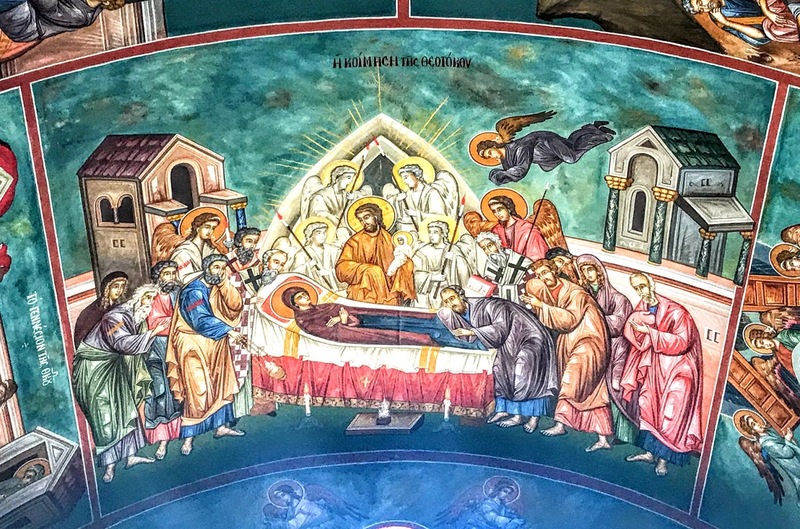 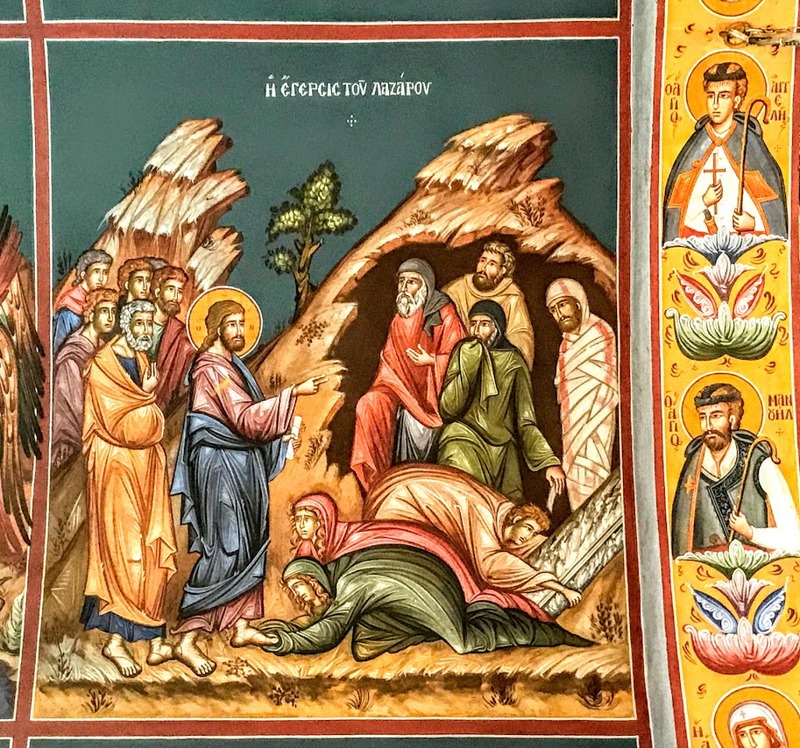 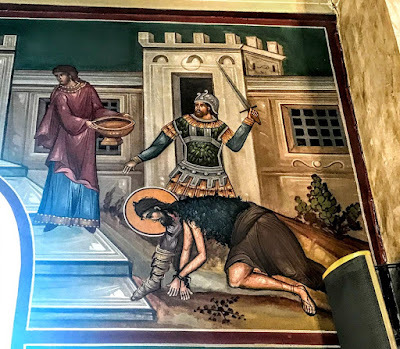 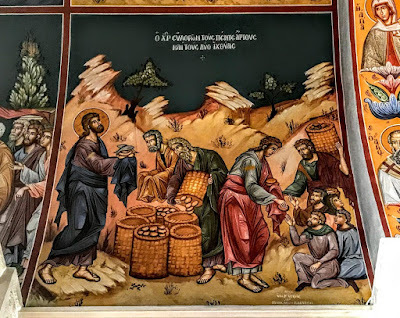 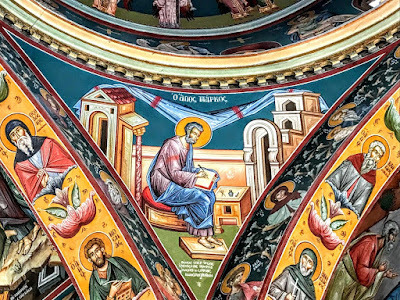 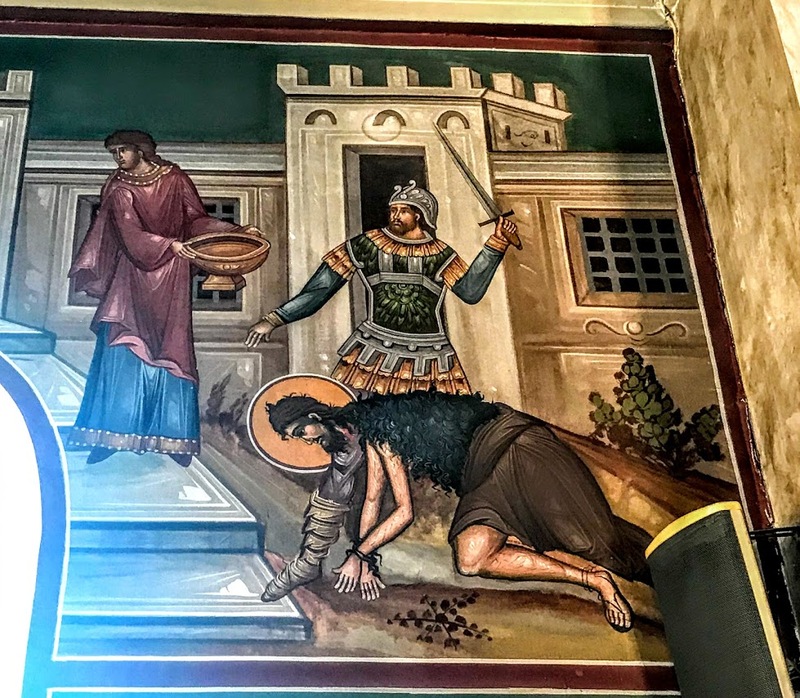 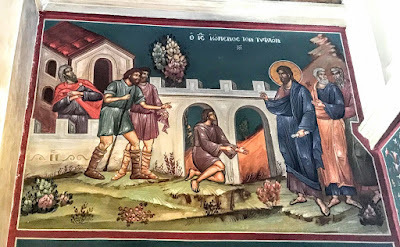 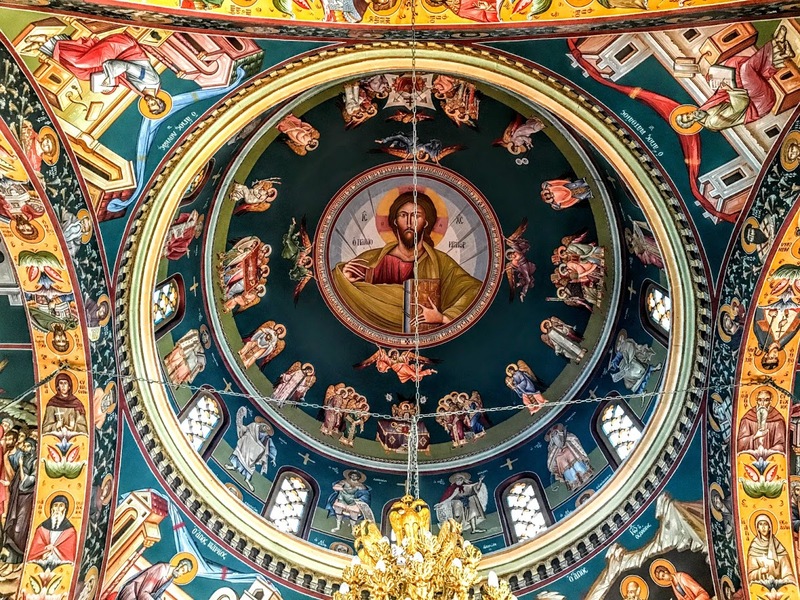 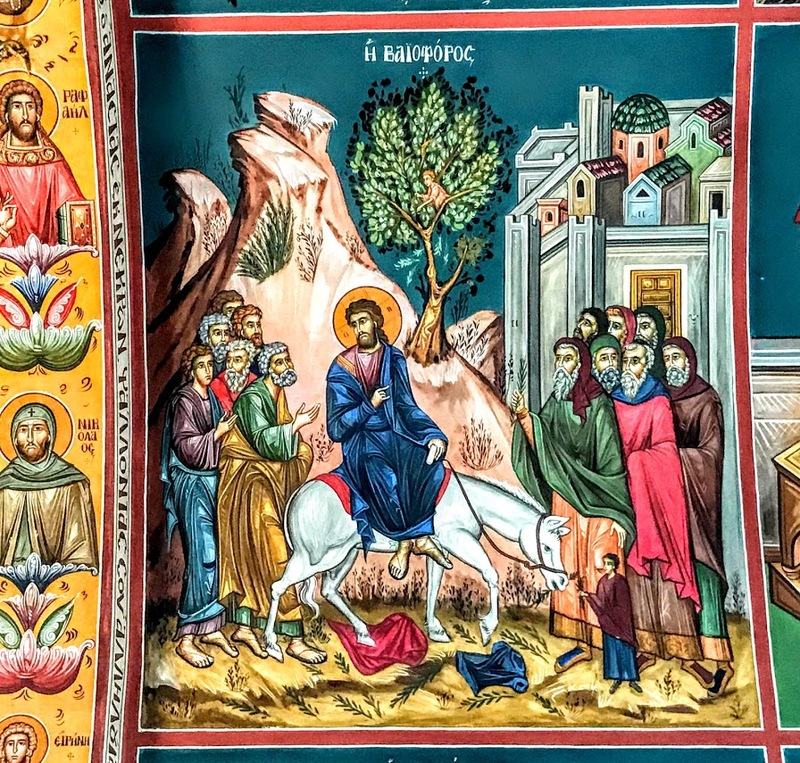 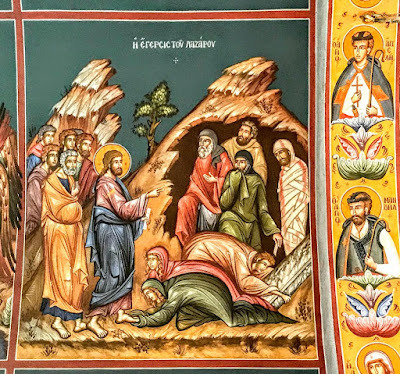 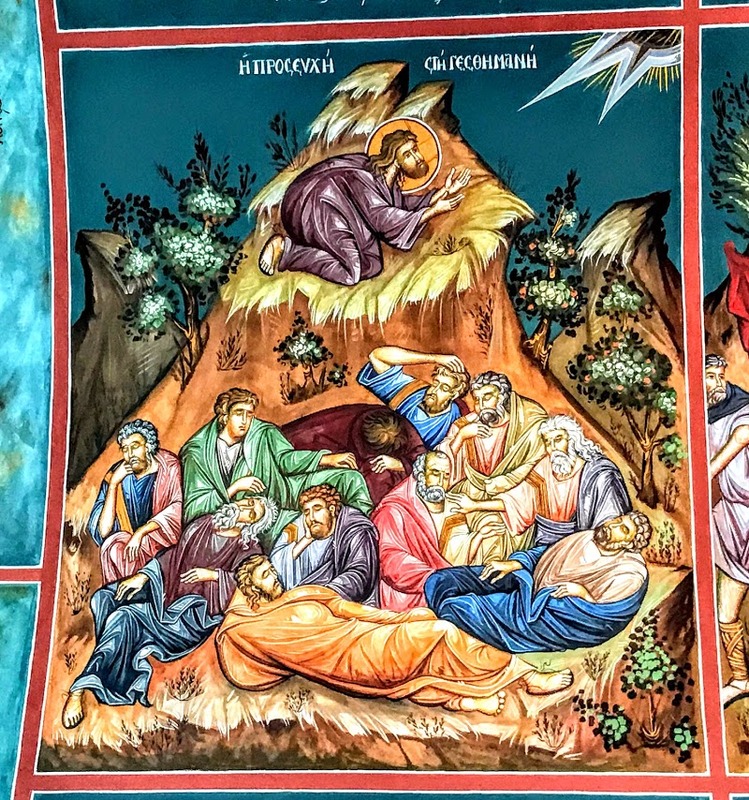 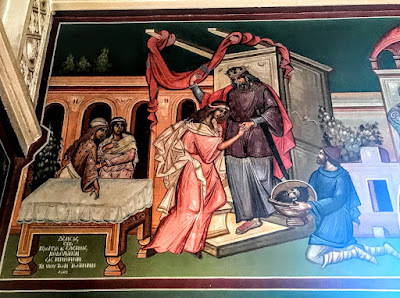 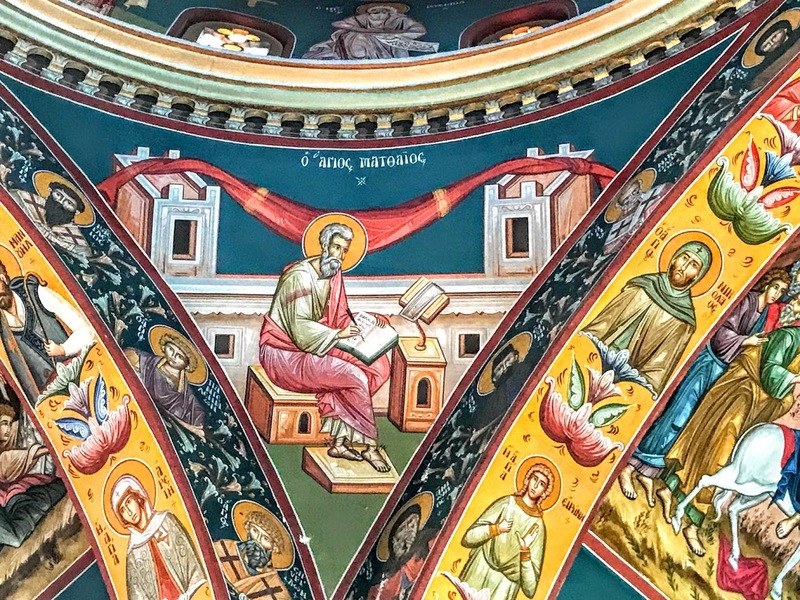 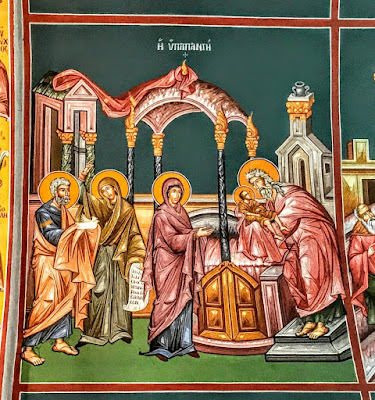 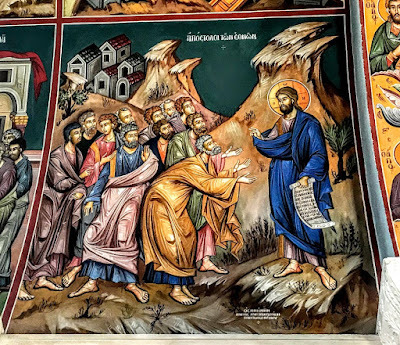 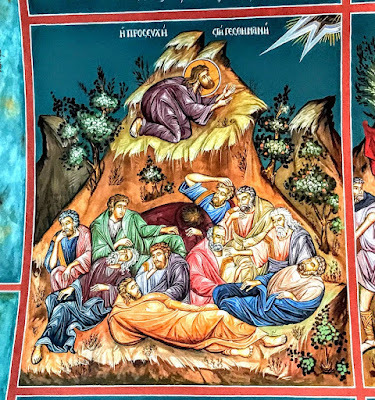 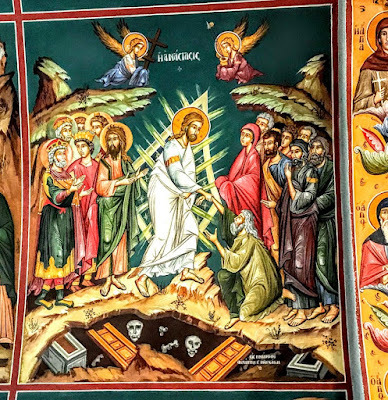 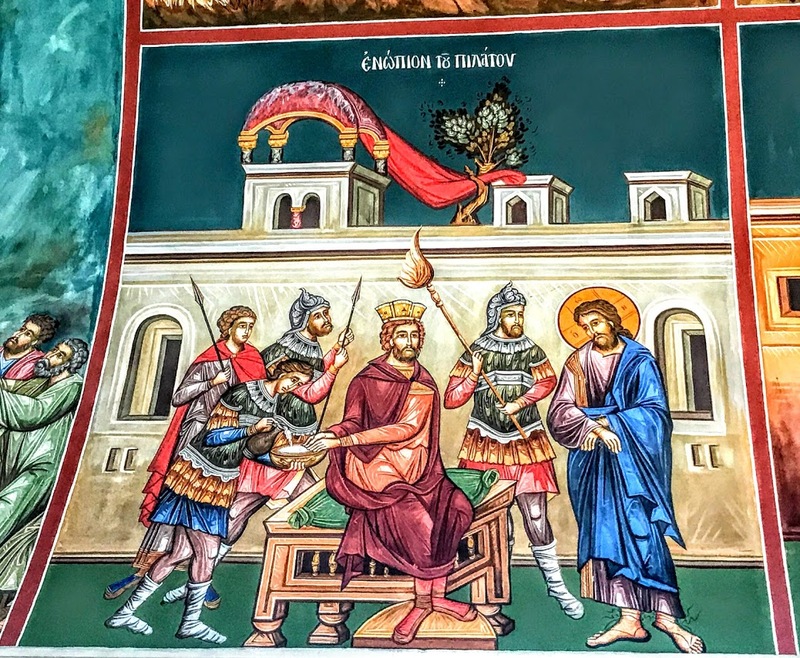 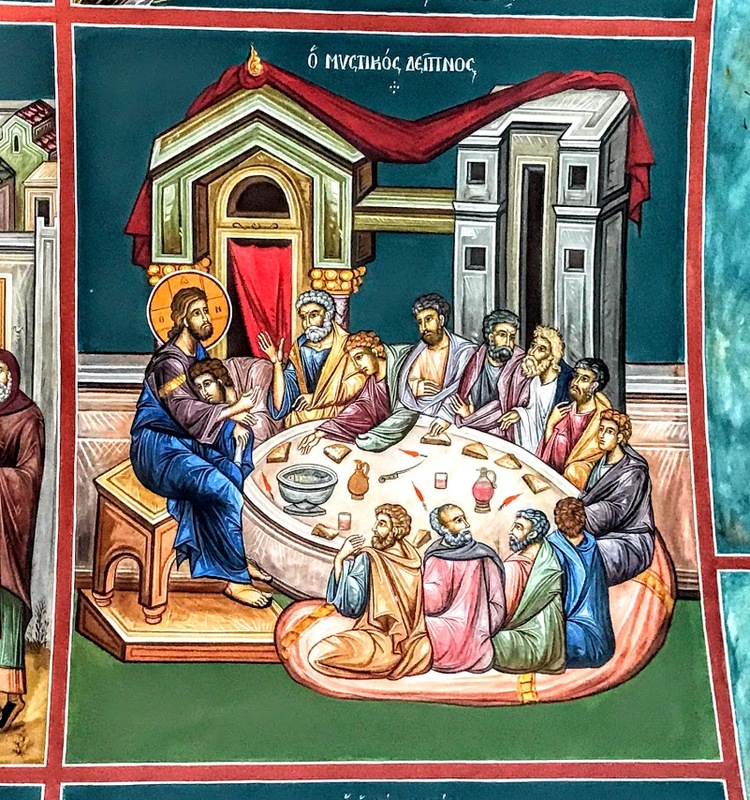 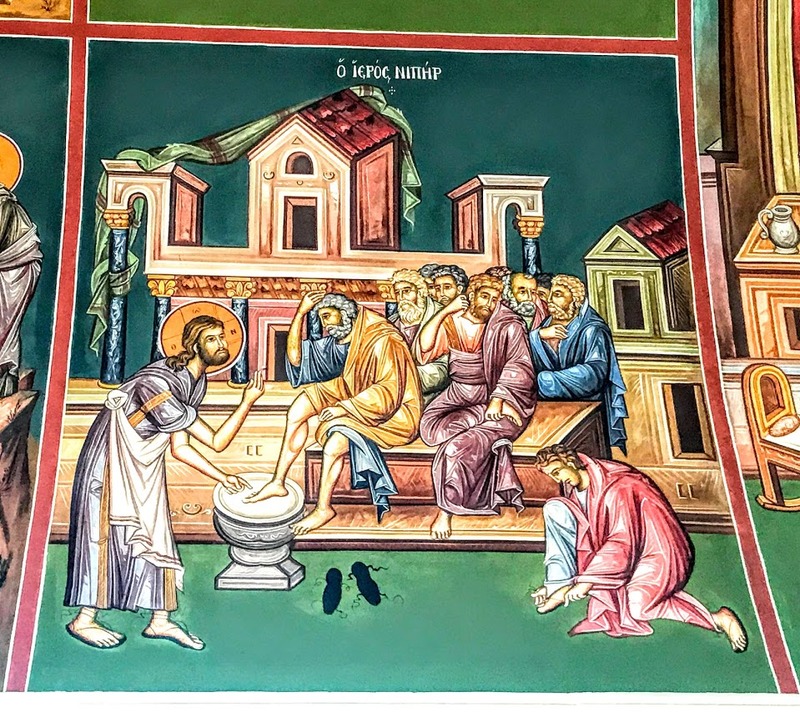 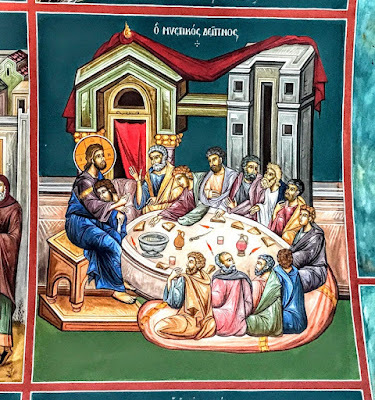 But inside, the dome and the frescoes covering the walls are an almost-overpowering example of contemporary Greek iconography at its best – modern in style and approach, yet maintaining a clear continuity with the Byzantine traditions. 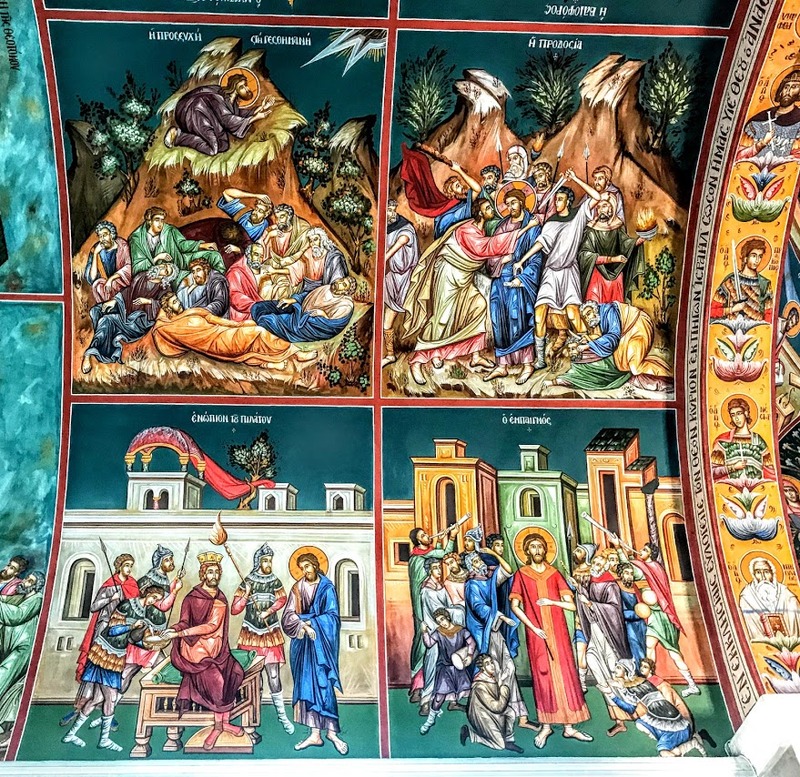 One section of the north wall in the nave has four panels depicting scenes from the Passion of Christ: Christ’s Agony in Gethsemane (top left); his arrest in the Garden (top right); his trial before Pilate (bottom left); his humiliation by the soldiers (bottom right).